Woodstock at night is strangely quiet and feels a little edgy. The lights are on, though, at Honest Chocolate in the Woodstock Exchange and the dark chocolate aroma that wafts from it has an almost pantomime magic. We’re ushered behind the counter and into the ‘kitchen’, where it all happens. It’s full of bearded hipsters standing about sipping Bruichladdich’s Classic Laddie and nibbling on Honest Chocolate’s 72% with Maca. Known as a source of natural energy, this South American root gives the dark chocolate a delicious malty flavour. Devon, the head bartender from House of Machines and our presenter for the evening, is so passionate about Bruichladdich whisky that he has a tattoo of the distillery on his arm. Now that’s what I call dedication. He takes us through four of the whiskies, detailing the history of the distillery on Islay (one of the Hebridean islands off Scotland) and its dedication to creating an authentic and characterful product. Bruichladdich’s whiskies are made from purely Scottish ingredients: all the barley is Scottish, and the water used is from a farm on Islay. There’s a focus on community and on the environment. The tastes that emanate from the whiskies are proof – peatiness, saltiness. Close your eyes and breathe in the Hebrides. Did you know that 80% of the taste of whisky comes from the nose? Neither did I. We tasted the 88% Honest Chocolate – pure decadence – with the Black Art 1990 whisky as Mike and Ant, the Honest Chocolate team, told their story. Theirs is chocolate that’s made with love, with no artificial additives. There’s no dairy, no processed sugar. It’s handmade from raw organic cacao, sweetened with agave. Incidentally, they’ve got a café in Wale Street that serves a banana bread bunny chow. No further persuasion needed. The perfectly peaty Port Charlotte was served alongside Honest Chocolate with coconut oil. This is what love tastes like. Melt in the mouth, they sell it both as a spread and coated, as bonbons. The capped guy next to me announced that the whisky smelt like window putty. He was spot on. Best tasting window putty on earth. We ended with the Octomore and 72% with Kalahari Sea Salt. A sensorial feast of heavy peatiness and breezes off the wild Scottish seas. 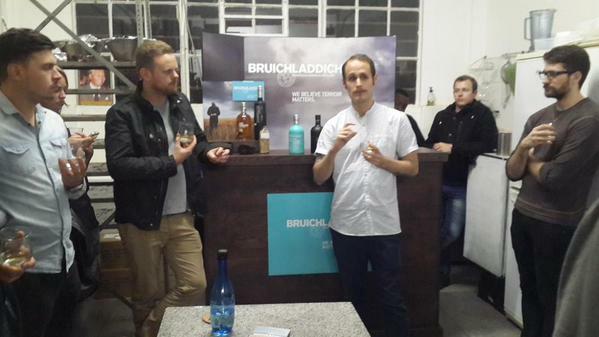 The Bruichladdich and Honest Chocolate Tasting at the Woodstock Exchange took place on 27 August 2015. 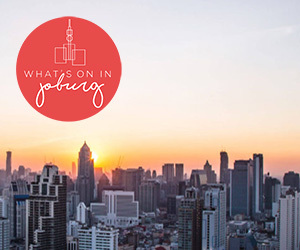 WIN WITH WOICT: To stand a chance to win a pair of tickets to the next Bruichladdich: Artisan Showcase & Whisky Experience on 9 September at Dark Horse, simply leave your full name and a comment below. Draw takes place on 3 September 2015. Stay up to date with all our latest competitions as well as our weekly Editor’s Picks and reviews: subscribe to our newsletter. I’m a huge Islay fan! Plus chocolate is always good, so this would be fantastic. Time to take me husband for a wee taste of Whiskey. With his Scottish blood (from the clan MacDonald – no not Ronald MacDonald) he loves a good good one, and I know it is a bucket list for him to do a wee bitta tastin! Sounds like there is a whole lot more to eating chocolate and drinking whisky than I realised. I am looking forward to being ‘educated’. I’ve recently started to submerge myself in the wonderful world of whisky and its fascinating global history. In fact, trying to propose a project at work whereby we promote the culture of whisky. Would be insanely awesome to experience this event. i would love to experience this ‘sensorial feast’. I simply have to find out what the “Best tasting window putty on earth” tastes like. I have already started practicing my Scottish accent for the evening. I have had the pleasure of experiencing Bruichladdich’s whiskies, it is truly an excellent whisky. Combining it with Honest chocolate may just take the experience to a whole new level. I hope I will be lucky enough to find out. Congratulations Pinto Williams – you are a winner! Please see your email for details. Please please please please please!!!!!!!! “88% Honest Chocolate with the Black Art 1990 whisky” ……. absolute instant bliss. C’mon (C’mon), c’mon (C’mon), ……. Please please me, whoa yeah! This sounds like a divine experience for the senses. To be ‘Honest’, I love chocolate. Chocolate and whiskey – YUMO! What a nice theme for a lovely evening. Och, sounds like a wee fun night, in typical Scottish style, Islay-ed love to have some FREE tickets. Please let me have a ticket. Whisky and chocolates….what a good combination and both close to my heart. What a perfect way to spend a day. I would be in line already if there was one. My husband loves his whisky, and with today being his birthday – what a lovely gift it would be! Sounds like a great event to showcase our local talent! What is not to like? Whiskey and some bespoke furniture to sit on while you drink it! I am very interested in this as South Africa is producing some excellent Whiskeys. RIP Darryl Dawkins. Chocolate Thunder.